We found some trees that change color in Southern California! Over Halloween weekend, Evan and I decided to get out of LA for a bit. He’s been working 6- or 7-day weeks, and he finally had a full 2-day weekend to relax for the first time in more than a month. Also, neither of us really like celebrating Halloween, so it was the perfect weekend to get away. We considered Palm Springs, or Santa Barbara, or even Solvang, but they all seemed troublesome and pricey that weekend — there was a giant Phish concert out in the desert, and Santa Barbara has a major Halloween celebration, so we thought of some place a little closer and quieter — Ojai. We were only going for one night, and we only decided to go a few days before the weekend, but thankfully things weren’t too busy and we were able to book a beautiful room in a very cute and cozy bed and breakfast called Inn Harmony. Inn Harmony is on a residential street just a block away from the main shopping and restaurant area. The yellow house had only a few rooms and it really felt like staying in a friend’s beautiful guest room. The furnishings looked new and were a mix of classic shapes with contemporary funky fabrics, the bathroom was quite modern, and we even had our own little balcony. 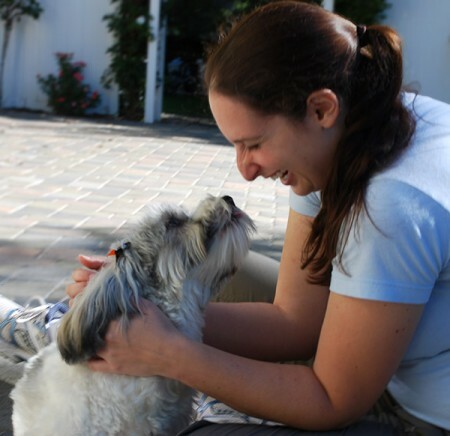 There was a wine and cheese happy hour, a nice yard and porch where we spent time reading, and an absolutely adorable and friendly little Havanese dog. Ojai turned out to be a great little vacation spot. 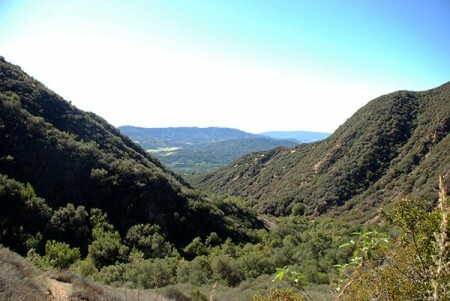 We went on a nice hike which crossed back and forth over a small stream and gave us some beautiful views of the Ojai valley. There were so many hikes in the area that we had a hard time choosing which one to do. We also had a nice dinner at the Ranch House, where we sat on their heated patio in a lush garden. We got a very private table that was on its own platform amid the trees, and shared a bottle of wine and a nice meal. We also went wine tasting at the Old Creek Ranch Winery, which was just outside of Ojai. We tasted a large selection of their small runs of wines and were impressed with all of them, especially the now sold-out sauvignon blanc and the sangiovese. Though they buy their grapes from other vineyards, they do make the wine on the pastoral property, and there were plenty of people picnicking with their families and dogs. Ojai turned out to be the perfect weekend retreat for us. We relaxed, spent time outdoors and had fun checking out the little shops that featured the very talented local artists, like Steven Spiro. It was also really easy to get to — it only took about an hour and a half to get there. I’m excited to find another weekend when we can go back. 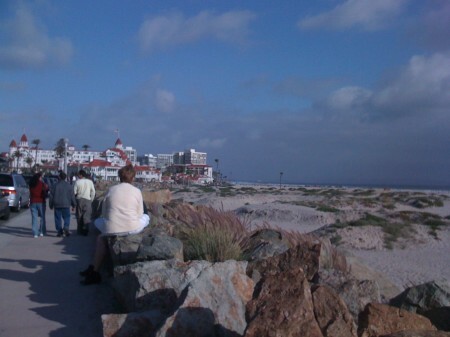 This weekend, I went down to San Diego to see a friends’ play, The Cradle Will Rock, and my friends showed me around the city with a fun driving tour and a walk around Coronado Island. 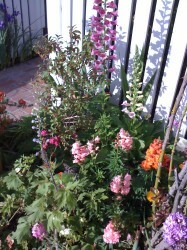 The fun started at the beginning of my day, though, when I got to go to my favorite brunch spot, Plums, in Costa Mesa. Plums has amazing eggs, pancakes and waffles, and Evan and I were regulars when I lived in Orange County. It can be a wait, but it’s always worth it, especially for the enormous Dutch baby (a kind of baked pancake souffle). This visit, my sister Michelle and I shared the shirred eggs and a lemon meringue waffle, which were both delicious. Then we headed down to San Diego, where Michelle goes to school and where I was visiting my friends Lindsey and Sean. They took me on a driving tour through University Heights, Old Town, Downtown and plenty of other neighborhoods before we crossed over the big bridge to Coronado Island. We got out and checked out the historic and lovely Hotel Del Coronado, with its stately white wood and red roofed exterior and dark wood interior. We walked down the beach, where we watched kids jumping across rocks, and we wandered through some of the residential streets, which had beautiful houses with very pretty gardens. 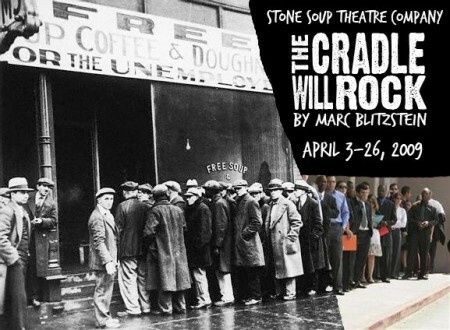 We grabbed a quick dinner at the Village Pizzeria before heading downtown to see The Cradle Will Rock, a musical Lindsey directed that’s still running for a few more weeks at the Tenth Street Theater if you’d like to catch it. The play is about the Depression, unions and selling out, and it focuses on the story of corporate big-shot Mr. Mister and his cronies who put their morals aside for money, and Larry Foreman, on the other side, leading union efforts. I didn’t know about the play before, but Lindsey filled me in on some of its history, which is just as interesting as the show itself. The initial, federally-funded run of the show in 1937 was shut down because of its pro-labor/pro-communist leanings, and the cast performed the newly banned play from the audience of another theater in an impromptu gathering. There’s a fictionalized version of the story in the Tim Robbins film Cradle Will Rock, which I’ll be adding to my Netflix queue. The play felt very much like an impromptu performance, with a minimal set and props, actors performing multiple roles and a piano-playing narrator who also took on some small parts. There were quite a few times during the performance when the actors came right up to the edge of the audience, and it felt like they were speaking and singing directly to each of us individually. If you’re in the area, the play is worth checking out, and tickets are $25 presale or pay-what-you-can at the door. Check out a few more San Diego photos on Flickr. 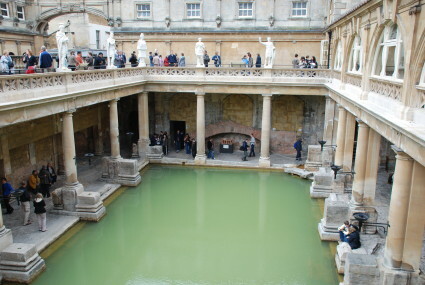 Though it seems like we were in Bath many many moons ago, it’s only been about three weeks since Evan, his parents and I journeyed Westward through the countryside to spend a day exploring Roman baths, checking out a fashion museum and walking along some rather impressive crescents. 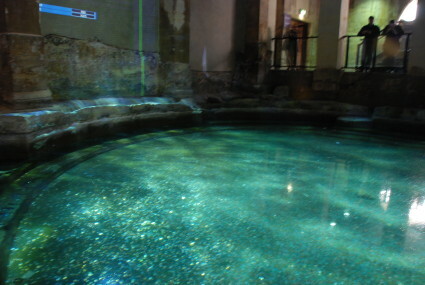 The Roman baths were definitely the highlight of my trip — the complex was bigger than I anticipated, we actually tasted the hot spring water (which was a bit gross), and we got to listen to a ridiculously over-narrated audio guide, which delved into rather long and semi-salacious stories of imaginary bathers like the rich aristocrat Octavio and the widow Flavia hanging out together by the bath. We also got to check out some of the inner workings of the complex. 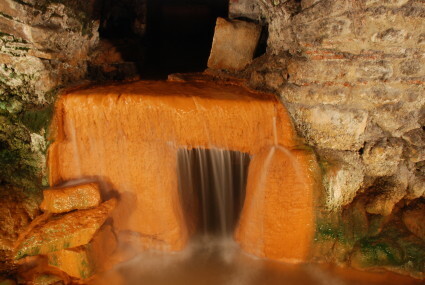 Here we can see the naturally hot water flowing down into other channels. 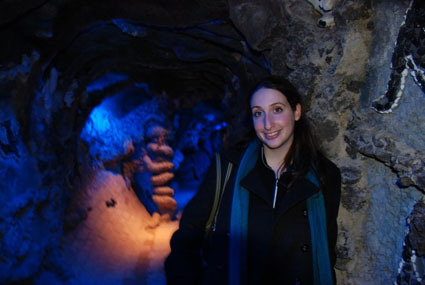 And there was a fun, glittery room towards the end of our tour, which had a sort of funny video display of men walking around the baths, chatting about their days and drying off. There were some slight technical glitches, though — you can see that the projector wasn’t exactly showing us the most interesting display here. The belle of the ball? Then there was the fashion museum. I had higher hopes from this well-reviewed museum. Some exhibits, like the one on Victorian clothing, were interesting. Others were a little less interesting. 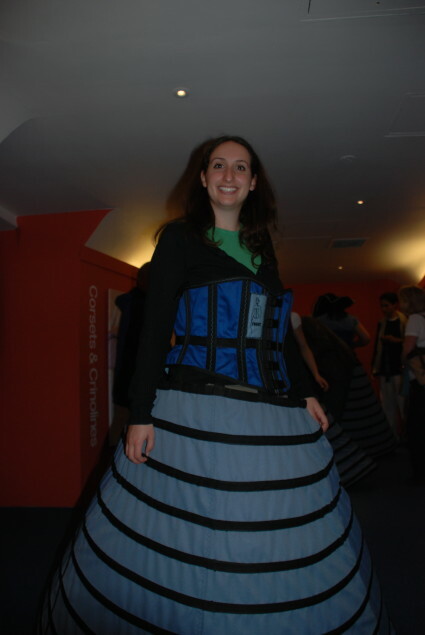 My favorite part was the interactive element — we got to try on a corset and crinoline. I couldn’t find one that fit — the medium ones were already being tried on, so I was left first to struggle with one I couldn’t get anywhere near closing and the one in the picture, which left me swimming. It wasn’t exactly authentic either — it had laces up the back, but plastic clasps like a life jacket on the front. You can more photos from the day on Flickr. It’s been a busy weekend! After my trip to Oxford yesterday, I was inspired to venture out of the city yet again — this time, taking advantage of the lovely sunshine and heading to the seaside — to Brighton. The train was packed on the way down. I was lucky enough to get a seat, but there were lots of passengers left standing or sitting on the floor. 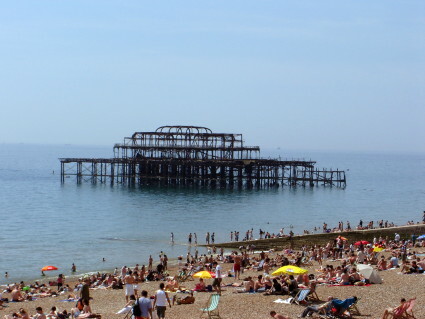 When we finally got to Brighton, there was this huge flow of people heading downhill from the station toward the water. The first thing I did was check out the coastline. I was surprised that there was no sand, just pebbles. I took some photos of the old, twisted metal pier frame still standing in the water (though just barely), and also photographed the current pier, with its rides and arcades and traditional piery things. 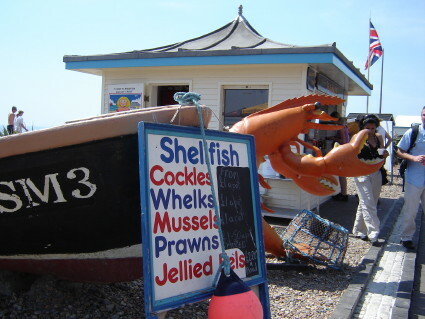 It seemed like every shop was hawking fish and chips, and there were signs for eels and puns with plaice and even a giant lobster by a poster that said “I got crabs in Brighton”! 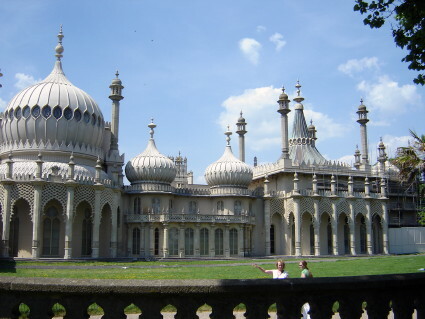 I decided to do a little sightseeing before relaxing, so I went to the Royal Pavilion, the bizarre Asian-inspired seaside palace of George IV. From the outside it was striking, with its white pointed domes, and from the inside, it was truly spectacular. Unfortunately, we weren’t allowed to take photos of the inside, but the highlights were the dining room, which has a 30-foot-long chandelier with dragons holding lotus-flower light shades in their mouths suspended from a giant dragon’s claws in the middle of a domed ceiling painted with plantain leaves. (Seriously, it’s sort of shockingly insane.) The music room was also interesting, with a similar shockingly dramatic look. And it was interesting to see the king’s chambers and some of the more private areas like the kitchen, which came complete with stuffed animals (including rats!) to make it seem like it would be used today. After the Pavilion tour, I went to check out the Lanes, a shopping district of alleyways, which was once a fisherman’s village. I was surprised by the quality of goods there, especially their fair trade, locally made and recycled/reused offerings. I was tempted to buy a lot, though I didn’t indulge. There were also some spectacular looking bakeries and ice cream shops. 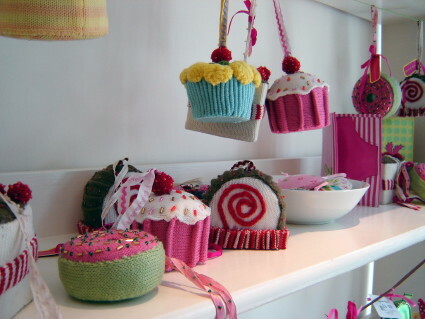 One particularly cute cupcake shop even sold little felt cupcakes and other goodies. Once I was done window shopping, I took a stroll down the crowded pier. It seemed like everyone had an ice cream cone with a flake bar sticking out of it in hand, and everyone also had a sunburn. 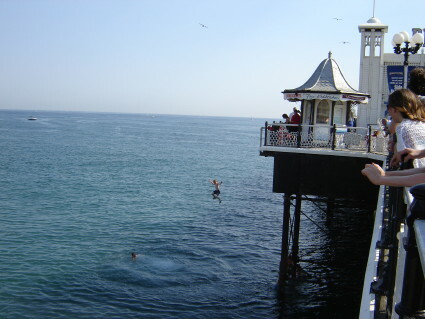 Almost as soon as I started walking the pier, I saw some guys jumping off and even diving — a big no-no according to all the signs posted. There were some angry looking security guards around and tons of spectators. Some of the guys tried to climb back up onto the pier, but I think they all ended up just swimming to shore. There are plenty more pictures, including ones of divers and the boys climbing back up on Flickr. Once I was done on the pier, I went to North Laines to walk around a bit and see the artier side of the city. I caught an interesting street performance where people dressed as mimes were putting on a show for a person sitting in a peep-show sort of contraption that had lots of windows that someone would open to tell the story. I only watched it from the outside, but it was pretty funny and most certainly absurd. There was also lots of street art to check out, and I took some good photos of the graffiti and graffiti-style murals in the area before catching the train home. Take a look at the rest of the day’s photos on Flickr. Today I finally made it to Oxford for the day! I took the X90 bus, and got there in about an hour and forty minutes. 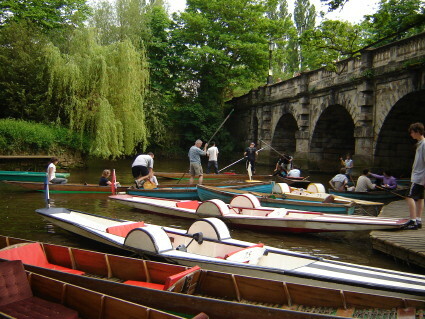 I met up with friends (well, connections — I’d never met them before) and wandered around the city with them for a bit, then went out on my own to explore the many colleges, churches and gardens Oxford has to offer. 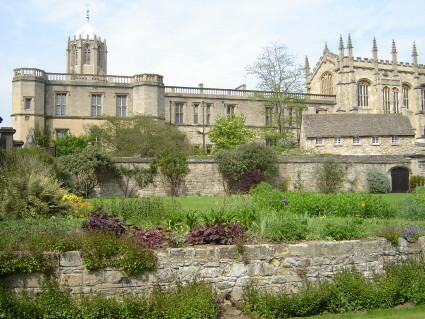 I started with the obvious choice — Christ Church College, the biggest and most renowned of Oxford’s colleges. I got to go into the dining hall, a room full of historic portraits, excessively long tables and a giant pump bottle of Heinz ketchup. Yes, it’s still in use for students today, who all eat their meals in the hall — on Christ Church-imprinted plates, no less!I also checked out the large quad and the cathedral. I don’t know if I’ve ever seen so many churches crowded into a small town like at Oxford. Each college seems to have at least its own chapel, and there seem to be spires everywhere you look in the city. The colleges also all seem to have their own beautifully manicured gardens, which are off-limits to visitors, and I could spy students picnicking, tanning and drinking beer beyond the gates in many of the colleges. 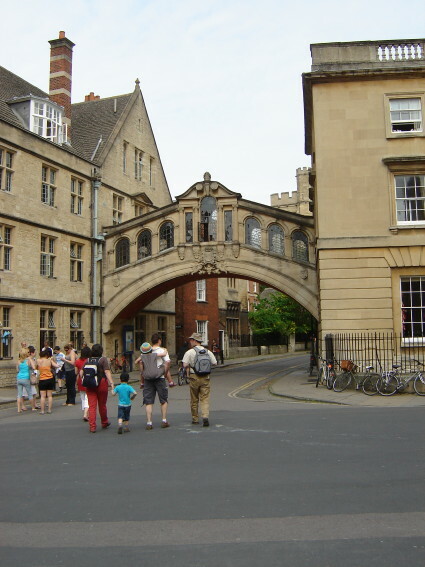 After checking out the river, I walked down a long alleyway by Magdalen College and ended up walking under a replica of Venice’s Bridge of Sighs, which curiously just crosses over a street. This brought me to the concert hall and library. I could hear a concert going on, but it was well underway and the doors were shut. 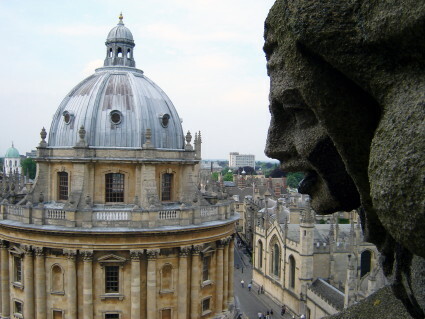 From there, I walked to the Radcliffe Camera and University Church, where I climbed the tower to get a view of the city. I walked around a bit more, back through the center of town, and went to check out “Oxford Castle,” which is apparently a center full of chain restaurants — quite disappointing. The best parts of the day were definitely seeing all the gardens and Christ Church College, and climbing up the tower at University Church. Just walking around town was also really nice, since there are lots of beautiful buildings with ornate details and the weather was perfect. Some close-up shots are on their way! You can check out all my photos on Flickr. 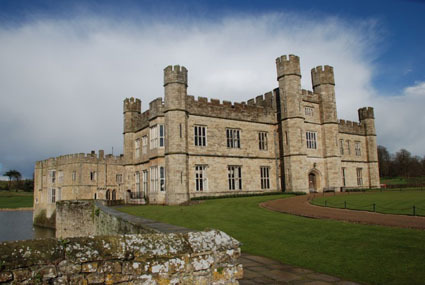 Saturday, Evan and I went to Leeds Castle. It all started in a pretty dramatic fashion, when we nearly missed our train. Evan rushed to buy one from an automated kiosk, while I tried my luck standing in line. Of course, we both reached the front of our respective lines at the same time, and while I was being hassled by the Victoria Station ticket agent, who told me I really should just go to Leeds Castle another day since it was already the afternoon and kept hassling me about our travel plans while refusing to let me purchase a ticket, Evan managed to get them. We ran through the station, rounding a corner where we could see our train beyond some gates, and the large digital clock, which was ticking down about 30 seconds from departure time. We struggled with our tickets to get through the gates, and finally hopped on the train — hoping it was the right one — before the doors shut right behind us. Whew! The train ride itself was thankfully uneventful, and we had a rather relaxing, hour-long journey to Bearsted, despite the looming clouds which threatened rain. 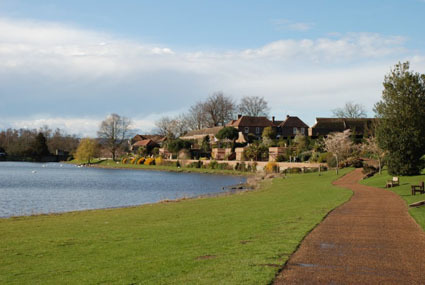 By the time we got to Bearsted it was quite rainy, the coaches had stopped running to the castle and the number outside the coach and car hire office wouldn’t connect us to anyone. So we walked into town and stopped at a pub for a bite to eat and directions. The pub, The Oak on the Green, turned out to have some good food, and our server helped us call a cab to take us to the castle. Once at the castle, the fun really began. 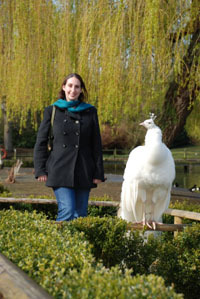 We walked through the duckery, where I got quite close to an albino peacock, which really became the theme of the day — me trying to get close to the birds, that is. And we caught some very nice views of the castle in the distance. 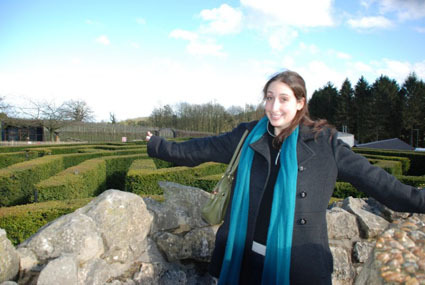 We then walked along a winding garden path, and finally approached the castle. We passed black swans, some sort of snake sculpture that emerged from the grass and a whole bunch of very whiny children (they all seemed a bit tired and on their way out of the park). 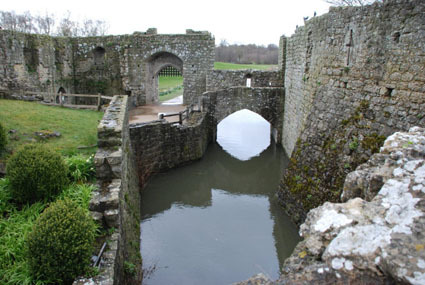 We entered the castle through the gatehouse across the moat, then walked around its outside to a back entrance. Inside the castle, we got to walk through a large number of rooms, mostly decorated for the castle’s most recent owner, Lady Baillie. There were also some really nice and clear exhibits on royal coats of arms, and the castle had an interesting history — it was used as a hospital during WWII, and Lady Baillie’s daughters served as nurses. And there were lots of bird drawings and sculptures decorating the rooms. Once we finished the castle tour, we headed to the dog collar museum (sort of interesting, though small), another garden, the aviary and the labyrinth, which were situated along a river. The labyrinth, though it looked small, still took a while to figure out, and we spent a good amount of time wandering its green corridors trying to find our way to the center. Once in the center, we got to climb up to see the top view of the hedge maze, then descended into the cool, watery grotto to make our way out underground. Though we could have stayed longer, had a picnic and caught one of the falconry shows or duck feedings, half a day was enough to have a good time at Leeds Castle. We wanted to check out the Go Ape adventure experience, but they seem booked up for a long while, so it wasn’t an option. And our only slight hassle was getting a cab. But once we got the number, they came quite quickly and were pretty inexpensive — £6.80 each way, I believe. 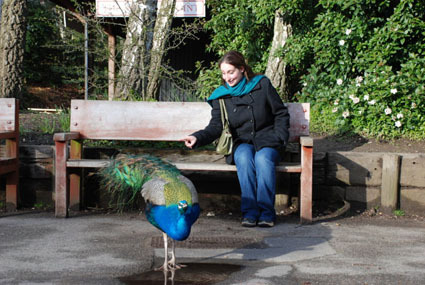 Also, admission was £15 a person, which lets you return anytime for an entire year after purchase. 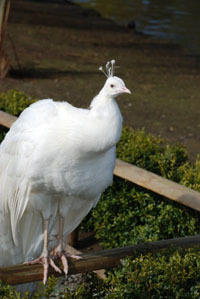 Check out more photos on Evan’s site. 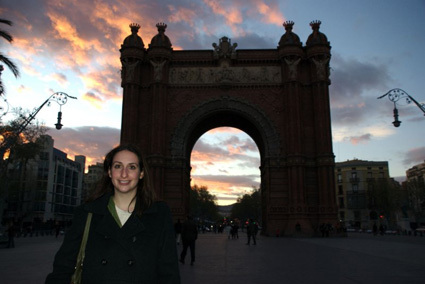 Our last stop on Monday was Parc de Ciutadella, which we entered through Barcelona’s Arc de Triomf. We also learned that unlike the arches in Paris and London and other European cities, this one isn’t commemorating a war victory, it’s just for show. We go to the park at sunset and snapped some photos in the remaining light, walked around the little lagoon where people were taking out row boats, and helped retrieve a stray soccer ball (Evan kicked it back).